Everyone knows how essential oxygen is for life and most of us have heard of or witnessed the miracles of various ozone therapies, but how many realize that Hydrogen plays just as important if not greater role then oxygen in the human body and for all life on the planet. We will have lectures from experts on the nature of oxygen and hydrogen (the smallest and most abundant particle in the Universe). You will hear about the most cutting edge water spa therapies on the planet as well as the great potential that Hydrogen has for healing. From Rudolf Steiner, Victor Schauberger and the cutting edge of modern quantum mechanics! You will learn the significance of the golden mean ratio and the frequencies of Hydrogen. We are pleased to announce the premier public unavailing in Prague of the Theraphi Plasma Healing Device (formally known as MAP) which is based on technologies developed by some very significant but little known innovators in modern times, Tesla, Lakhovsky, Rife and Priore. It combines harmonically inclusive cascading frequencies of hydrogen, brain waves and Schumann resonance. Be one of the first to experience the amazing effects of this device along with the clinical data that will be presented by its inventors. Come take the plunge into the 2016 International Water Technology Symposium for two incredible days. Join us on this roller coaster ride of information, demonstrations and practice. A tangible exploration of advanced water technologies. We are committed to developing innovation in health, agriculture, water treatment, sustainability and alternative energy production. Come witness this collaboration of inventors, visionaries, scientists, entrepreneurs, and investors. A forum for brilliant ideas, technology and new paradigm thinking, dedicated to the enhancement and preservation of our environment and self-empowerment in all aspects of life. As someone once said 'Problems cannot be solved by the same level of awareness that created them'. As we measure, repeat, validate, debate, discuss, analyze and share, you will discover dynamic and proven solutions to the growing energy and environmental needs of our planet, and ways towards a more humane system of healthcare. If you're passionate about innovations in energy production systems, sustainability and agriculture, health and education, and interested in being part of the solution-not the problem, then join us for these two exciting days.. This conference will have many presentions such as items below, to see review of most click the Study Guide tab above on this page. Oxygen deficiency has long been linked to disease, going back to Dr. Otto Heinrich Warburg in 1931, when he won the Nobel Prize for showing that cancer is caused by a lack of oxygen respiration in cells. He said that in normal cells, the replacement of oxygen respiration with the fermentation of sugar was a cause of cancer… that normal cells meet their energy needs with oxygen, while abnormal ones meet their needs (mostly) by fermentation. Normal cells are obligate aerobes, but cancer cells are partial anaerobes. because this situation is not optimal, your cells’ energy levels drop. They get tired, fatigued, with nothing left to give. If you’re low on oxygen (which happens more easily than you might think), your cells go into anaerobic mode, triggering a cascade of negative results. First, it slows your cells’ energy production. That slowdown leads to an aging body and many kinds of illness – including cancer. Cell oxygenation happens 10 times faster if you drink oxygen instead of breathing it. The quality and quantity of oxygen absorption into your liver and intestine is 6 times greater when you drink properly oxygenated water than when you breathe it. That’s no doubt been an impetus behind recent attempts to increase the oxygen content in water. Can water be created to contain remarkably stable high oxygen levels? How do you structure water so that it has the benefits of more oxygen available to release slowly in the body? How do you produce a partial change in the molecular structure of the water? How do you enriched water with oxygen? How do you use electric and magnetic field operating at a specific frequencies? The structure of this water is called a cluster. Its basic structure is a tetrahedron – 4 water molecules form the structure H8O4. These clusters remain stable for long periods of time. Because of the cluster’s small size, it can more easily penetrate cell membranes, or, alternatively, it can remain in the intercellular space. Re-structured water can be delivered to your body two ways – through your skin and through your stomach. For chronically or seriously ill patients, bath therapies are recommended in addition to the drinking water. The skin’s capillaries quickly absorb high levels of oxygen during prolonged immersion in re-structured water at exactly body temperature. Entire textbooks have been written about the benefits of oxygen and oxygen therapies for many health conditions, including cancer, infections, cardiac rehab, burns, and more. Studies have showed that drinking oxygenated water enhanced tissue oxygenation, because sooner or later poor oxygenation will catch up with you. 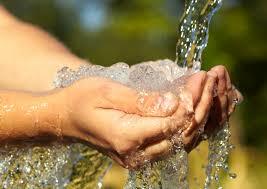 The oxygen in the water penetrates the mucous membranes of your stomach and GI tract to reach your tissues. In a person who suffers from a disease, the mitochondria are often trapped in a perpetual low energy state. The oxygen in the water helps to increase the membrane’s energy potential. It takes a “jolt” to push your low energy levels higher. Once you’re ill, this is not something you can do through drinking regular water or exercising. Almost everyone is oxygen deprived. Sufficient oxygen isn’t enough. You also need healthy blood circulation and adequate hydration to carry the oxygen to all the tissues and cells it needs to reach. Come and find out more how re-structuring water might help. How to test and analyze water’s vital qualities. What are the best methods? Water is a complex subject of study, and its properties depend on a great number of factors. Water research shows clearly that waters of the same composition can exhibit radically different properties. Therefore water quality analysis based purely on the assessment of chemical composition and content of contaminants is incomplete. We need an extended definition of water quality and complementary testing methods, that will be able to reflect water's capacity to store information and its ability to support life. Also we need to distinguish between the great number of effects various products are claiming to have. In this presentation, you will discover selected sets of qualitative & quantitative methods to describe the influences that have shaped a particular water's quality, and predict its effects upon living organisms. Be part of the Hydrogen Revolution for Health and Wellness. Aging is essentially: oxidation from within. As you age, your antioxidant defense system (your ability to fight free radicals) decreases significantly, leading to faster aging, low energy, and health challenges. H2 is the most effective antioxidant. As the smallest molecule it scavenges free radicals most efficiently, protecting DNA and RNA from oxidative stress and as a result from most diseases. Besides, H2 shows to improve cell signaling functions, metabolism and gene expression. Molecular Hydrogen's vast therapeutic potential has recently been discovered. Over 400 scientific studies indicate beneficial effects for more than 137 conditions where Molecular Hydrogen acts most effectively. Molecular Hydrogen shows promising results for obesity, type II diabetes, hypertension, fatigue, cancers, neurodegenerative diseases, Alzheimer, Parkinson, chronic pain and inflammation, allergies, auto-immune disorders amongst numerous others. Athletes report great improvement of performance recovery time and endurance with lack of lactic acid build up. Free radicals are the enemy of performance. They wreak havoc on muscles by contributing to lactic acid production and inflammation. Drinking and bathing in hydrogenated water offers efficient anti-oxidation, intercellular rehydration, anti-inflammation and pain relief. Molecular Hydrogen has cell protective properties which prevent tissue injuries often related to intensive sport-activities. Administration of molecular hydrogen can be easy, safe and efficient by drinking and bathing in hydrogenated water and use of Hydrogen releasing capsules. Other ways used in research include the breathing of pure Molecular Hydrogen gas and intravenous injections of Hydrogen saturated saline preparations. Ozone is an instable form of Oxygen where 3 Oxygen atoms are bounded. Ozone carries the role of nature's sanitizer with bacteria killing properties 3000 times those of chlorine. Ozone is strongly oxidative with it's associated benefits for hygiene and health and can be ingested due to it's oxidative qualities as a free radical fighter. Drinking and bathing in ozonized water has been shown to be effective in destroying pathogens e.g. viruses, bacteria and fungi. Ozone water baths allow for a profound cleaning and oxygenation of the skin. Ozone kills some cancer cells and can slow down tumor growth. More Oxygen is provided for the body and its functions by drinking ozonized water. Ozone is successfully used in medical practices by means of intravenous infusions. Ozone breaks down harmful synthetic chemicals as pesticides and odor-causing agents. This presentation is by one of Belgium’s leading water spa clinics. Find out first hand the experience of running a healing water spa! Water is truly one of the great mysteries of life, there are many question regarding this common substance that modern science still has not fully understood yet it is the foundation of all life. In the mid 90's Paul Harris was a co-founder of a water technology company called Sacred Water Inc. As one of the first companies creating imprinted and structured water the focus was water research and producing the worlds best drinking water. 20 years of research has led him to many amazing discoveries which he will be discussing. Exactly what functions does water facilitate on our planet and in our bodies? What is the best water to drink? We are born in water, drink and swim in it, it is the steam that eases congestion and the ice that reduces swelling, water takes on many forms in our daily lives. It influences 100 percent of the processes in our body, come find out how. Can we unlock the power of water to create energy? Is it possible to run a car on water? Can we use water to provide heat and power for our homes? Oxygen, without it we would cease to exist. The third most abundant element in the universe, it makes up two thirds of your body weight and half of the mass of the earths crust. Hydrogen, this tiny atom has a lot in store for us as we are just beginning to unravel its mysteries. 99% of the universe is Hydrogen and most of it is in it's highly excited plasma state. From Michael Faraday to Andrea Rossi, Paul Harris will discuss the diverse history of water's role in energy production. From the Pons and Fleishman Cold Fusion debacle to today's Low Energy Nuclear Reactions, Hydroxy fuel (Brown's Gas, HHO etc.) and renewable energy for Hydrogen production. Paul will also share various technologies and inventions that he has developed over the years to harness the power of water. New research from the Aerospace Institute of the University of Stuttgart in Germany supports the theory that water has a memory—a claim that could change our whole way of looking at the world. Does water have memory? Can it retain an “imprint” of energies to which it has been exposed? This theory was first proposed by the late French immunologist Dr. Jacques Benveniste in a controversial article published in 1988 in Nature as a way of explaining how homeopathy works. Benveniste’s theory has continued to be championed by some and disputed by others. The fascinating recent experiments with water “memory” from the Aerospace Institute of the University of Stuttgart in Germany indicates results with different types of flowers immersed in water are particularly evocative. If Benveniste is right, just think what that might mean. More than 70 percent of our planet is covered in water. The human body is made of 60 percent water; the brain, 70 percent; the lungs, nearly 90 percent. Our energies might be traveling out of our brains and bodies and into those of other living beings of all kinds through imprints on this magical substance. The oceans and rivers and rains might be transporting all manner of information throughout the world. Studies carried out by Dr. Masaru Emoto have shown that the thoughts of ordinary people can alter the structure of water without there being any actual physical contact with the water, and many other very important effects. If the water receives positive thoughts and is then frozen, the resulting crystal structure has a ordered often beautiful shape. While on the other hand, if negative thoughts are aimed at the water, whether just by looking at it and thinking, or by writing those thoughts down on paper, the resulting crystal shape is disordered, fragmented when the water is frozen. BIO-ACTIVE System’s Dan Winter was one of the first scientists to provide evidence that the shape of the universe is a Stellated Dodecahedron. As a shape capable of producing the perfect fractal, the stellated dodecahedron can cause, according to Winter's research, perfect charge collapse (implosion based on the Golden Mean) that creates gravity. The centripetal conjugate / fractal (therefore Negentropic) electric magnetic fields accelerate life and all living systems. Designing and maintaining life is the essence of the Hermetic project. It was the difference between life and death, and the turning point in the evolution of civilization. The Golden Ratio is the wave solution to constructive compression implosion, phase conjugation, negentropy and therefore life force, perception, and consciousness. All biology remains alive to the extent its electric-magnetic field is centripetal. That's what holds it together. Dan Winters Implosion Company presents solid science based on the unifying principles of the "Fractal Field" along with its technical applications, such as the water energizing device known as “The Imploder”. An inspiring new order of pure scientific principles, the fractal field operates and expresses itself through "Phase Conjugation" and the design of life giving, healing, age regressing charged fields as used in the pioneering “Theraphi Plasma Healing Device” you can witness at this event. The Fractal Field Unified Theory and the principle of the Golden Mean allow for the addition and multiplication of waves of charge and energy. Fractals exhibit self-similarity, meaning their inner structure has the same pattern as their outer structure (like a pine cone or a fern tree). Just as fractality describes the geometry of waves of energy or charge, fractals manifest as wave patterns that evolve ad infinitum - like an encoded thread linking larger spirals to infinitely smaller ones. Only the Golden Ratio allows for constructive interference of wave addition and multiplication. Because a fractal signifies infinite compression, it is what spans the gap between the symmetries of the very small and the very large. The idea of symmetry is vital to both. Symmetry is part of the language of nature, from the molecular level on up. Quantum physicists can explain the menagerie of fundamental particles we observe - quarks, gluons, fermions, bosons and more - as different facets of a symmetrical object. Relativity, too, is an expression of the symmetries that exist between space and time (Einstein's famous equation E=mc2 articulates a symmetry between mass and energy). Groundbreaking physicist Andrei Linde has found fractals helpful in modeling the behavior of the universe, and is currently spearheading research suggesting that the fractal nature of space may actually be the cause of gravity. World famous research scientist El Naschie has calculated groundbreaking mathematics proving the universe is a fractal based on the Golden Ratio. The work of Alain Connes has shown that non-commutative spaces naturally evolve toward fractality. In fact, most astrophysicists now agree that the shape of the universe is a dodecahedron and that the Golden Ratio is the essence of fractality and thereby the root cause of gravity. Sacred Geometry is the blueprint of Creation and the genesis of all form. It is an ancient science that explores and explains the energy patterns that create and unify all things and reveals the precise way that the energy of Creation organizes itself. On every scale, every natural pattern of growth or movement conforms inevitably to one or more geometric shapes. At the root of all cultures is a single, universal code of knowledge, which has the potential to unite all things, referred to as sacred geometry (the term first coined by our friend, colleague and author Robert Lawlor). From its simple base in pure numbers, it develops through musical harmonies and geometric proportions into a complete, coherent picture of creation. Mother nature uses geometry everywhere you look, from the spirals of the nautilus shell, galaxies, sunflowers, snowflakes, flower petals, honeycombs and the deepest design of the smallest particles know to humanity! Sacred Geometry is the modern bridge between science, physics and spirituality. It is described as the Architect of the Universe, the footprint of God, the design of the infinite. It was always used in the planning and construction of religious structures such as churches, temples, mosques and sacred art. All the Platonic solids (including the shape of water) are Golden Mean proportioned. Representative of our global scientific and philosophical heritage, the Golden Mean is now being rediscovered and applied to cutting-edge physics and breakthrough technologies. Nicola Tesla, Georges Lakhovsky, Royal Raymond Rife and especially Antoine Prioré in France. It creates precise frequencies, based on hydrogen and the golden mean ratio, which allows the addition and multiplication of waves of charge and energy. This centripetal negentropy waveform is the only type of electromagnetism that effects the bodies cellular regenerative system. 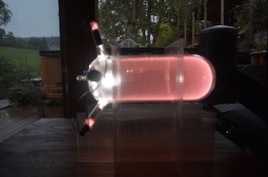 The Theraphi produces a powerful double conjugate plasma light / infrasound “Bio-Active Field”, using modulated electromagnetics from robust solid-state emitters, which pass through a unique mixture of noble gases. It produces an extraordinary implosive (Negentropy / life giving) plasma field which has been proven to have medical applications. The Theraphi technology has the potential to have a huge influence on pain reduction, longevity, enhancing immune systems and reducing healing times. It restores coherence in single and multicellular organisms thereby increasing the potential of homeostasis in cases of many degenerative diseases. It is also known for increasing circulation and sensation in areas where these have been limited or lost. Negentropy is reverse entropy. It means things becoming more in order, it is the force that seeks to achieve effective organizational behavior and leads to a steady predictable state. Life is considered to be negentropic because it takes things in less order, like food, and turns it into things in more order, like cells in the body, tissues, and organs. Negentropy and self organization is well documented in phase conjugate optics. Symmetric coherent wave fields converge in such a way that their focal point becomes centripetal and self organizing to create an increase in net order. The Theraphi produces a negentropy effect on the cells and tissues of the body, which is the only scientific definition we have of “Healing and Rejuvenation” and “Anti-Aging”. The actual "healing" system in the body is the cellular regenerative system. All living things are made up of cells. The cell is the smallest living thing that can do all the things needed for life. All cells must come from pre-existing cells, and have continuous repair and maintenance of their own existence. This is an electromagnetic system, but of a rare kind not used in our common power systems. Instead of using the common transverse EM waves, this system uses longitudinal EM waves and time-polarized EM waves. A time-polarized EM wave is an energy current in the time domain, as in the quantum field theory. There we are introduced to time-polarized photons a "compression and rarefaction of the local rate of flow of time". Biological systems use longitudinal EM waves, frequency modulation, amplitude modulation, and "time-domain" electrodynamics which the Theraphi produces. In fact, it uses it to heal damaged cells, organs and tissues. The Theraphi system tailors the specific scalar longitudinal waveform, producing mitogenic radiation, primarily in the UV region of the spectrum but also involving other frequencies. It directly effects a cells nucleus with phase conjugate (time reversed) waves, which helps restore the cells memory of being “healthy” - the process of Cell Memory Reversal.